The night commences with the 12th Annual Battle of the Drums Competition and Show. 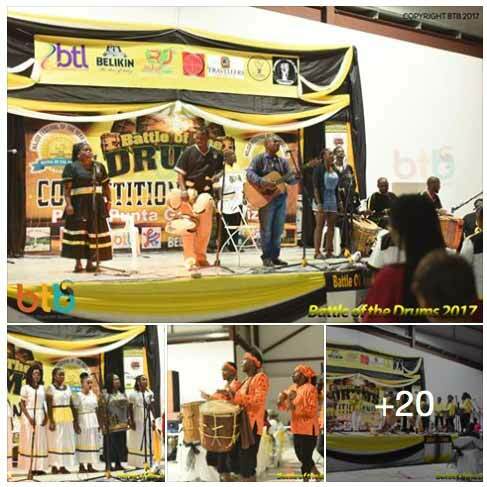 This is a Competition and Show that allows groups to compete and display their musical artistry in playing five (5) different categories of Garifuna drumming. The first Battle of the Drums was held in Punta Gorda Town on November 17, 2006 and was well received by spectators from home and abroad. In 2007, there was even a bigger audience and greater enthusiasm. As of 2008 the event has evolved into an international drumming competition and show involving drumming groups from various parts of Belize as well as from neighbouring Guatemala and Honduras. This competition and show has become a major local and tourist attraction and a catalyst for significant economic activity in the Punta Gorda Area during the period when it is hosted. The Battle of the Drums Competition and Show is held every year on the Saturday immediately preceding the 19th day of November. The Belize Garifuna Musical Festival takes place immediately after the Battle of the Drums and will continue until 6:00 a.m. on the morning of November 12, 2017. This is the second year that such an event is being organized in Belize. The Belize Garifuna Musical Festival will feature performances of various genre of Garifuna Music by local and international renowned artists. The winners of the Garifuna Song Competition will also be in attendance. The performances will showcase the following music forms: Hungu Hungu, Paranda, Gunjei, Punta, and Punta Rock.